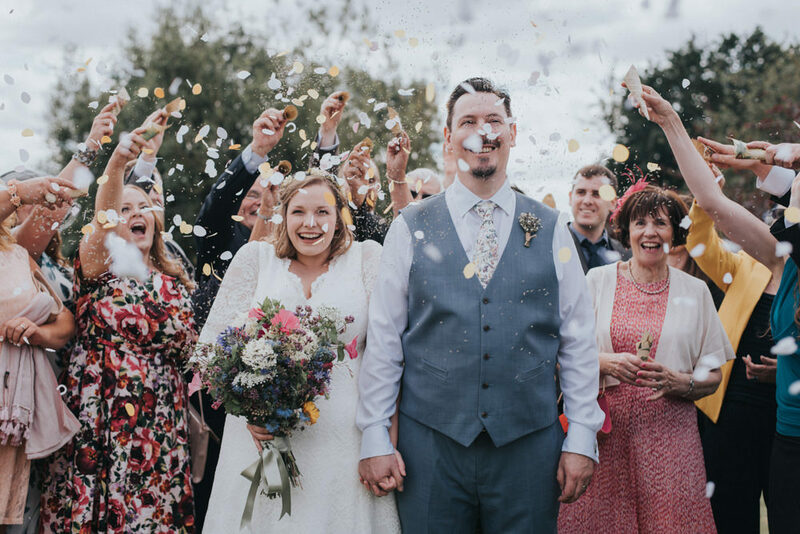 Laura the Bride: I had always dreamed of an elegant, vintage-style, floor-length gown in corded lace: reminiscent of the Edwardian era, A-line in shape to hide the hips and display the waist, unfussy yet with detailed neckline and – this was absolutely crucial – long, floating sleeves. My frivolous certainty that it would easily be possible to tick all of these boxes, albeit on a very small budget, swiftly turned to despair. After ordering – and returning – many perfectly ‘nice‘ high street wedding dresses, I was beginning to lose hope (and my mind). And time was running out. Then I happened upon the ridiculously reasonably priced bridal range at BHS (God rest its soul!) and found the Bella gown, in a thick cream lace with pretty scalloped neckline and matching scalloped hem. It was the only dress I had tried on and felt instantly happy in. The one problem: NO sleeves! So I searched for solutions to this problem; from tulle jackets to piano shawls, there was not one bridal ‘cover-up’ on Pinterest I had not perused. Now I am an avid cardigan-wearer. I’m a fan of covering up. But, cardi-wearer though I may be the other 364 days of the year, my wedding day (in the middle of August) was the one day I did NOT want to be piling on the knits. I felt it would ruin the simplicity I so adored about my dress. Enter BHS (may it RIP) once again to the rescue! I spotted that my already bargain wedding dress had been reduced in an end-of-line sale. I therefore purchased a second dress to harvest it for its lace! The fantastic team at The Robing Room made my dreams a reality by creating the long, flowing sleeves I had always wished for, with matching scallop detail taken from the bottom of the ‘donor’ dress. My bridal ‘outfit’ was completed with a beautiful dried flower crown, made with lavender and yellow yarrow by The Artisan Dried Flower Company for a bit of old-time rustic charm, and a £5 pair of lacey flats that felt like slippers! I decided to do my own makeup for the day after a horrsterical (horrific meets hysterical) makeup trial with a “MUA” from which my mother and I emerged resembling killer clowns (before that was a ‘thing’). Helgi and I are avid readers and we knew that we wanted to reflect this important aspect of ourselves, our shared passion for literature, in our wedding ‘theme’. 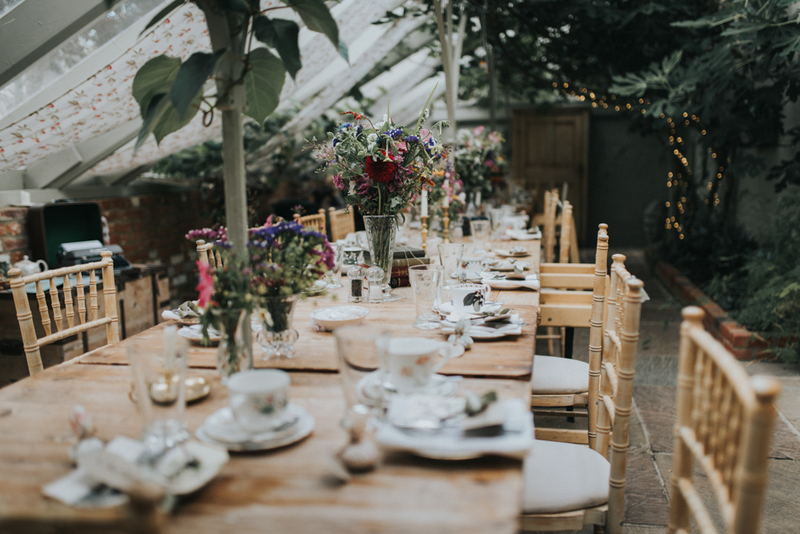 As a child my favourite book was Frances Hodgson-Burnett’s ‘The Secret Garden’ and, after one visit to this delightful restaurant and a wander around its enchanting, walled grounds – I was bewitched. 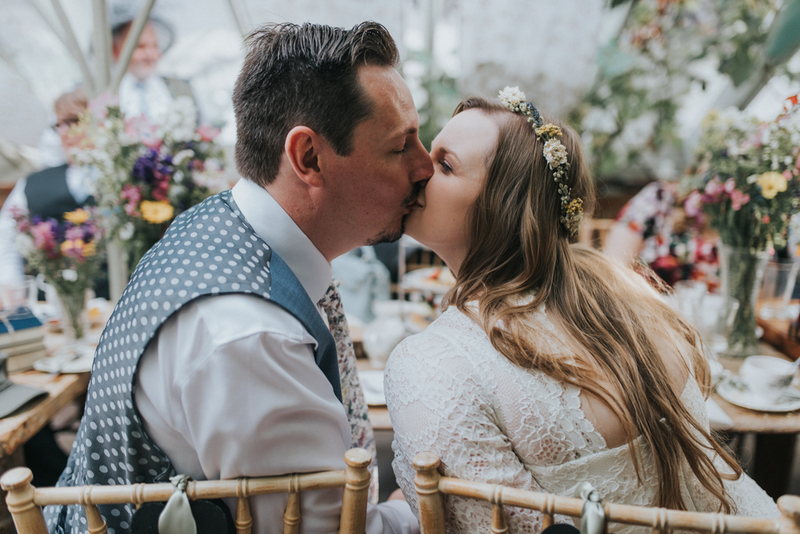 When I saw the glasshouse where we could hold our intimate wedding reception (with its vines creeping slowly along the walls, chintzy china displayed on an antique dresser, where nature meets vintage refinement) – I was in love. We could not have chosen a better setting for our marriage ceremony. There was no colour scheme! (I loathe starchy colour schemes!) But there were definite, defined themes running throughout. Keys: In the story, the key to the garden is a hugely important symbol. I created place-holders/favours from a huge assortment of genuine aged keys! I bought them as a job lot on eBay and was so happy with the authenticity they lent! They looked magical, like real keys dug up to unlock a secret place! Botanical bunting (probably my biggest DIY undertaking) fashioned from ‘upcycled’ pages of The Country Diary of an Edwardian Lady’. I LOVE the illustrations in this book and used it for many different elements of the wedding including the place settings for the table and confetti cones! Flowers – mixed wild varieties, grown locally, arranged by myself into vintage cut glass vases and used in my bridal bouquet. Bridesmaid dresses – mixed wild flower pattern in a host of colours. Wedding favours were wild flower seeds sewn into miniature floral-patterned parcels – so cute! Glassware and brass candle sticks all purchased in charity shops or boot fairs throughout the year. My favourite finds were the tiny glass bell we rang for the speeches, and the pair of wee-willy-winky candleholders we used for pictures in the evening. Most importantly for us, were the framed photographs we displayed of family-weddings-past, including those of our parents, grandparents and great-grandparents. It felt right. A copy of ‘The Secret Garden’ H bought for me some years ago served as our guest book. Other ‘props’ – including an old Typewriter. 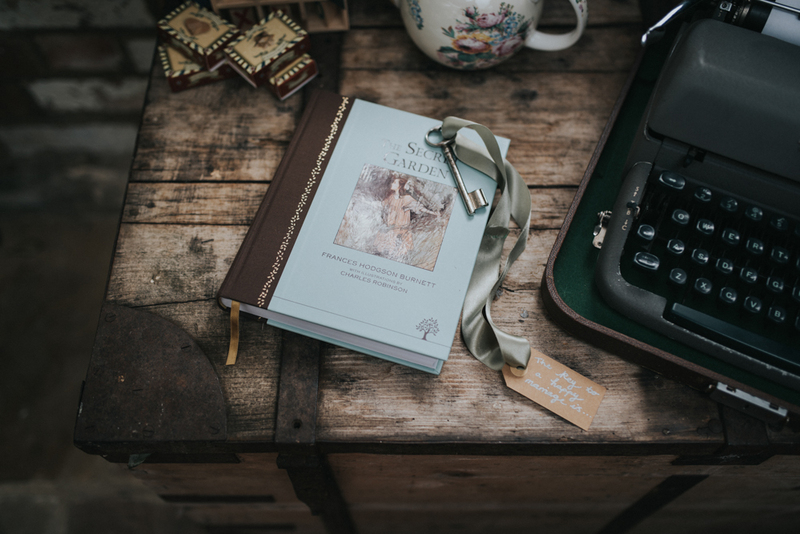 Use of ‘The Country Diary of an Edwardian Lady’ for many different DIY touches throughout the wedding. Our joint Husband/Wife wedding speech was based around quotations we took from the 1913 editions of ‘Don’ts for Husbands’ and ‘Don’ts for Wives.’ Performing this light-hearted speech we had written together was one of my favourite moments! We were very fortunate to live in the same village as the lovely Sarah Mattocks of ‘Flora’s Garden,’ a cut-flower grower. 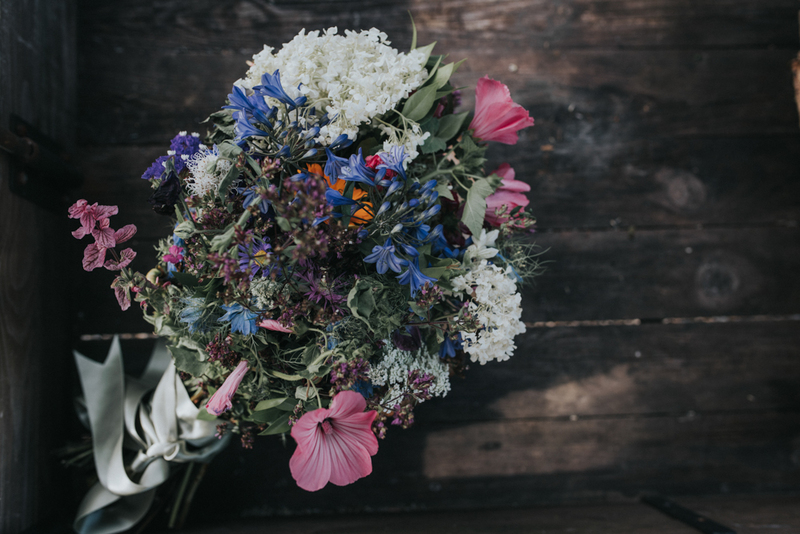 I contacted Sarah early as I knew exactly what I wanted – a wide range of seasonal, wild flower varieties in an array of colours, which I would arrange myself. 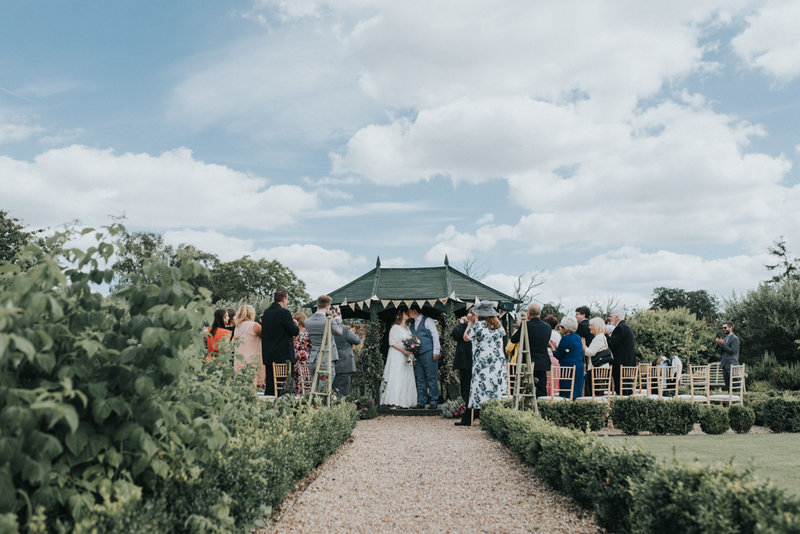 The rationale for arranging the flowers myself was two-fold: firstly, we were arranging the whole wedding on a shoestring budget and secondly, I happen to love the fresh-from-the-meadow feel when an abundance of varieties and colours are loosely and haphazardly arranged. Which was lucky – because I have no flower-arranging experience, watched 2 videos on Youtube and just had a go at it the day before my wedding – and I loved the effect. My bridesmaids Ellen (my sister) and Claire (my best friend) wore beautiful, simple floral dresses from Lindybop. They looked lovely and the dresses suited the occasion perfectly. My sweet little flower girl, the aptly named Rose, wore an edible ensemble from Debenhams and looked angelic! 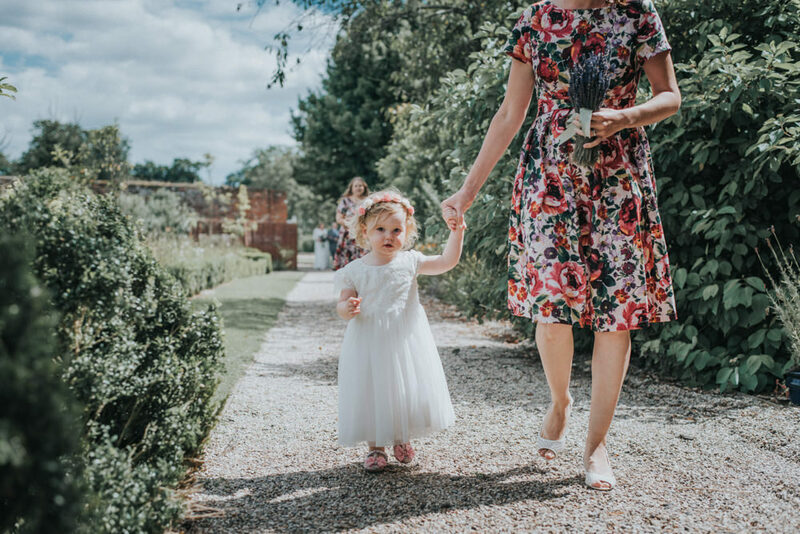 I walked down the aisle (through the garden) on my father’s arm to a beautiful, little-known folk song both Helgi and I love called ‘The Detectorists’ by Johnny Flynn. Helgi surprised me with a lovely, rustic ring box made from a ring of a bark, engraved with our new shared surname and the date of our wedding. Helgi and I had been together for almost 9 years (and engaged for 8 of them) by the day of our wedding – so we’ve had a long time to think about our wedding ceremony! I am also a real poetry-lover (any child in my primary school class will tell you – I’m always banging on about it!) so felt sure that exactly the ‘right’ poem, or reading, or quotation, or lyric for our ceremony would make itself known to us along the way. However, as it turns out, it is a lot harder than it might seem to find a precise, condensed expression of exactly what you want to say to and about the person you have loved and shared your life with for nearly a decade. In the end, and favouring simplicity over schmaltz, we selected ‘You’ve Got a Friend In Me’ (yes, the song from Toy Story…) and one of my favourite poems ‘Oh the Places You’ll Go’, performed touchingly by my brother, sister and mother. The latter Dr Seuss rhyme has particular meaning for me, as it is a book H bought and quietly presented to me whilst I was struggling through a particularly tough teaching practice. It always summons a smile and a tear. We were desperate to hire a live band, but knew realistically that this was well outside the reaches of our budget. Luckily for us, a friend of my mother’s sings in a brilliant 8 piece band ‘Hidden Agenda’ and offered to perform for the evening at ‘mates rates’! They were fantastic fun and had everyone up on their feet – we all had a blast! One of the many reasons we chose ‘The Secret Garden’ to host our wedding is its reputation for sublime food, and they really did deliver on the day! We opted for a 2 course Afternoon Tea served to us in the Glass House. 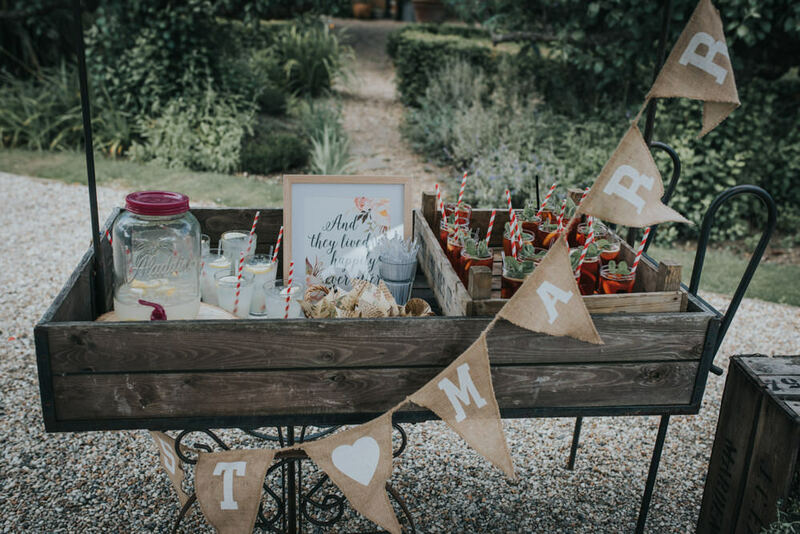 The reception was perfect – all of our day guests commented on the food. 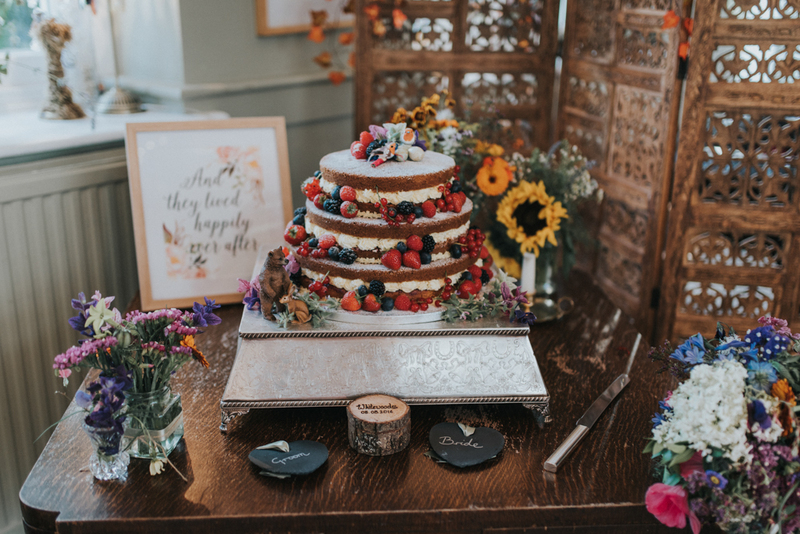 As with so many elements of our wedding, we were so very lucky when it came to our wedding cake: a friend of the family just so happens to have been a baker by trade and created for us our dream ‘naked’ wedding cake, with three tiers of light sponge and scrumptious raspberry-laden buttercream. Decorated stunningly, it was almost too beautiful to eat! I never enter competitions – so what made me enter the ‘Win Your Wedding Photography’ contest on Bai & Elle’s website, I will never know. But I am SO glad that I did. We wrote to the fabulous and up-coming photography duo, otherwise known as Meg and Marni, with a vague, sketchy outline of our plans, themes and our venue and were over-the-moon to discover we had been selected for FREE photography for the day, plus a complimentary ‘connection’ shoot (sorely needed, as I am like a plank o’ wood in front of the camera). Of all our lucky finds along the path to our wedding day, discovering these two talented ladies was by far the most fortunate! They captured the essence of our wedding day, and the beautiful images they have created will serve as a lasting memory of our golden afternoon in August. Wedding on a ‘shoe-string’ budget! (It is completely possible if you are willing – and brave enough – to roll up the sleeves do-it-yourself! Our wedding cost under £5000 in total). – Get married on a Monday (or any other weekday) – the packages are so much cheaper! – DIY your décor – I lost count of all the projects I had on the go, from making my own paper bunting to arranging my own flowers, complete with bridal and bridesmaid bouquets. Don’t pay someone else to do it – if you have an idea, just give it a go! I so enjoyed immersing myself creatively into weaving my wedding together by hand that I was a little lost when it was all over. (And my flat was a tip). Oh – and use Pinterest to help you! – Get family and friends involved. We are incredibly grateful for the generosity of our family and friends. From the invites (designed by my talented little brother), to the gorgeous wedding cake, to the brilliant black cab transport (provided by my Uncle, a London cabbie) we are indebted to so many for helping to create our perfect wedding. – Become a charity shop / boot fair trawler – bargains to be had and heirlooms to ‘upcycle’! – Make your own dress. Literally, if you have the vision and the skills. Or with the help of a seamstress and some alterations if you only have the vision bit! There are beautiful high-street dresses out there that could be altered to be your perfect gown. Designer labels are surely less important than being able to afford to invite your Gran to the wedding? – Be different. If you want to. Don’t plan the day you think everyone else is expecting – consider what you and your spouse-to-be truly want. 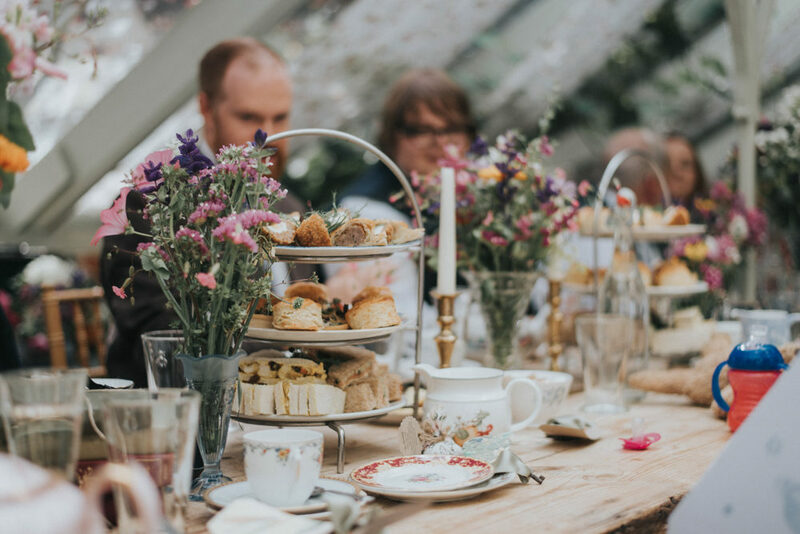 Serve afternoon tea, invite only a handful of your nearest and dearest, get married at a local restaurant. We did all of these things and regret nothing! Headpiece The Artisan Dried Flower Co. I LOVE the Secret Garden theme. So original that also gives so many options. It also shows you don’t need to spend loads to get something oh so special.